I’ll be the first to admit that a little knowledge of a subject can actually hurt you when writing. You know what they say about assuming anything. I assumed during the writing of my first two novels that I understood Victorian undergarments. To be more specific, I knew what they were and their basic function, I did NOT take myself out of my 21st century thinking when writing about them though. Perhaps at some point I will go back and right that wrong, or write as it were. Let’s start with the basics. There were six main pieces that women of most social classes would have worn in the late 1800’s to very early 1900’s (the period I write in, it does vary a bit depending on the year, as with any fashion, trends change. Sometimes quickly). Think of the chemise as a slip. 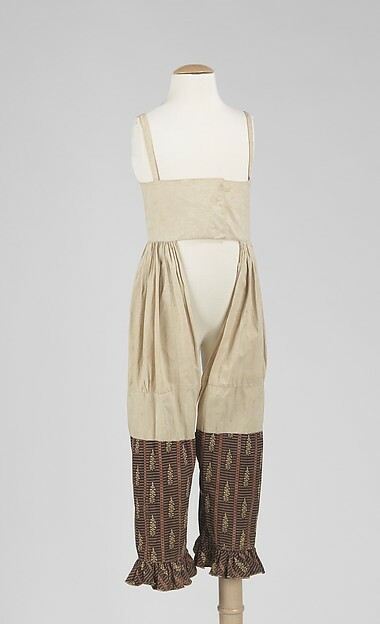 It would have been worn as a base layer and made of linen or cotton depending on the year, the one pictured is probably linen as soft cotton wasn’t used until later. These were hand sewn and served not only to keep the corset (or as they would have been called then, stays) off the skin. It would wick perspiration from the skin and keep it from soaking into the corset, which would have been harder to wash than the chemise. It is difficult to tell from the picture, but the chemise would have been fairly voluminous (until late in the 19th C.) and also served as a base petticoat. By about 1885, most were sleeveless and made of cotton. First, let’s talk about terms that are used to describe women’s undergarments incorrectly. Do not be mistaken and call women’s undergarments pantaloons. Pantaloons are men’s pants worn as early as the mid 17th C! They are the voluminous pants that men wore that stopped above the knee worn over stockings…think King Henry the 8th. Don’t use the term interchangeably with pantalettes, those are a wholly separate thing. And, to be fair, pantalettes are not correct for the time period I write, either, they were worn about 40 years before. Pantalettes were most commonly worn by little girls and sometimes went all the way to the ankles. 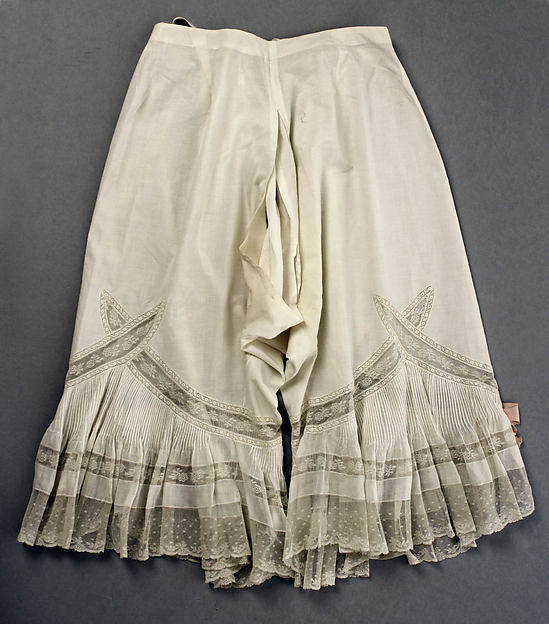 Bloomers is also a bit of a sketchy term as that is more correctly silk or wool knee-length great puffy pants worn with long trousers and petticoats, the term “bloomers” was not used to mean undergarment until about the 20th century. You could probably get away with using this term if you get tired of the actual term, which is…drawers. Drawers were for men, women and children and is, in fact, the easiest to understand term. However, they probably don’t look like what you think they look like. most pictures don’t show you well what they looked like, if you look closely on the image, you can see that the seam in the front only comes down about four inches. They are a bit like cotton chaps that tie in the back. When one wears stays properly, there is no “pulling down” of undergarments. Drawers were tied under the chemise and the center seam was open to allow use of the facilities without having to completely undress, you’ll understand why in a bit. This is probably the most misunderstood bit in the Victorian undergarment collection. This is the garment that we like to stick our collective 21st century nose in and refuse to understand. Let me get a few misconceptions out of the way right away. First, a properly fitting corset would feel just as good to a Victorian woman as a properly fitting bra feels best to us today. She would feel just as uncomfortable in a brassiere as you would feel in a corset if you just grabbed one and put it on. Second, writer’s take creative licence with stays, and they always will. Stays, put on properly, can take as long as thirty minutes and a minimum of five to allow your body to gradually get used to it. They do not damage organs. Women still corset today and, when done as it was originally, can actually be beneficial for back pain sufferers. Think about the braces they make men wear who lift for their jobs…they are corsets. Some men actually wore stays during the Victorian era as well, but that is for another post. Lastly, you should never, EVER release the busk (the front closures) on a corset to remove it, even if you’re not cinched 2-4″ as was common then. The heart is a powerful thing and when the blood flow changes that rapidly within your body, the most likely thing that will happen is that you would pass out. As I said, if you read bodice-ripper fiction, they take a bit of creative license here but if you enjoy it, you can probably suspend your expectation of reality. This is also why women couldn’t have “pulled down” their drawers, they would have had to completely undress. Also, when we hear that women cinched 2-4″ we cringe and think it would be incredibly uncomfortable, it isn’t. Just like a woman who isn’t well-endowed today wears a smaller cup size because she doesn’t need the support of a larger chested woman, she would’ve only cinched 2″, it’s barely noticeable. Larger women or curvier women needed the extra support and cinched further to 4″ to get it. I’ve done it, it still isn’t uncomfortable. The wasp-waist was only done for a very short period in history, yet it seems to take over when people think of stays. 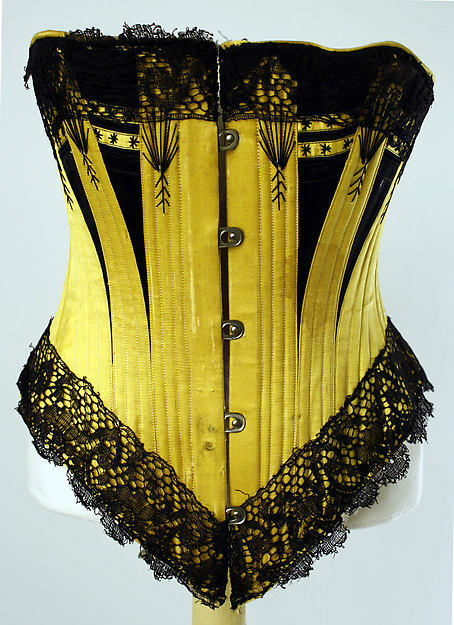 There are two types of common Victorian corset and which one you had would have been determined by your stature. If you were short-waisted, you most likely would have worn under-bust style stays. If you had a longer or more curvy body (yes, there were curvaceous women then too!) you would have worn a full corset that would have acted as both a body-shaper and a bra all in one. Probably most interesting of all, they made stays specifically suited for various activities, bathing/swimming, riding (these stop just under the navel and are curved up on the sides), and even maternity. A woman, as in those from and originally from Europe, would not have left their home without one. The chemise was just not sturdy enough to provide needed stability for the activities women did, especially pioneer women. http://www.metmuseum.org ca. 1880 silk Isabel Shults Fund, 2001 This is a full corset. http://www.metmuseum.org 1890’s silk Gift of C.J. Vincente Minetti, 1972 an example of an under-bust corset. Stays tended to be somewhat bumpy and rough articles in comparison to the other Victorian pieces, so a corset cover became a necessity. This is, however, the one piece that a woman of lower social standing, read poor, might go without. These weren’t developed until later and were created for the sole purpose of protecting garments from catching on the busk and boning of the stays. 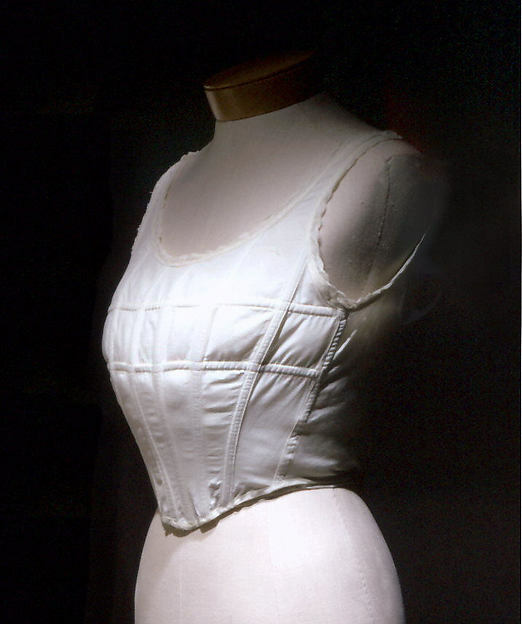 It is a soft shirt worn over the stays and some were quilted to help even out the lines of the corset. Petticoats probably morphed the most over the period I have been talking about. 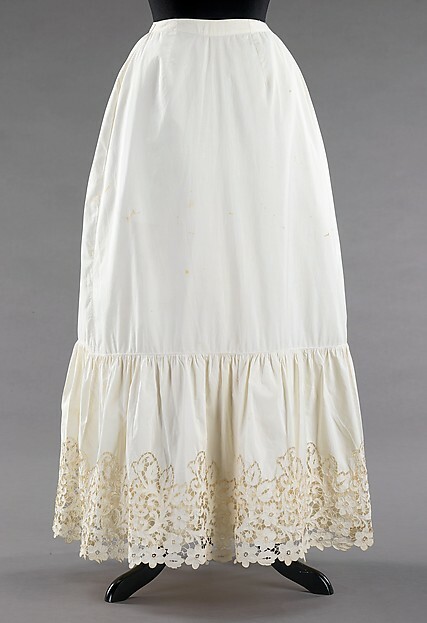 They began as full-length under-skirts with tiered hems to add fullness to dresses or skirts and eventually morphed into one-piece undergarments that combined the traditional petticoat with the chemise. This is a traditional petticoat. If you’ve noticed, I’ve tried to show that Victorian unmentionables often used color, stockings were no exception, and while farmers and the working class may have been relegated to black stockings, that doesn’t mean all women were. In the early 1900’s stays were fitted with long tails that the stockings could be attached to. Can you imagine how difficult it would have been to keep stockings up? Necessity is the mother of invention and the precursor to the garter belt was invented. However, before then, they just had stockings. Isn’t it funny that we complain if it takes us longer than a few minutes to throw some clothes on, these women wore more under their clothes than we wear on a daily basis! Great info! I can’t imagine they weren’t exhausted just getting dressed! I agree. It would take a major life adjustment for me to get used to adding that to my routine. I would have to sew. I dont think I could afford to keep myself in all those clothes otherwise.